"The KuHL ALPENWURX JACKET combines superior warmth with classic style. Constructed of 300 weight double-dyed fleece, the ALPENWURX can withstand the toughest conditions. The collar is lined with Italian Berber micro fleece for added comfort and insulation. 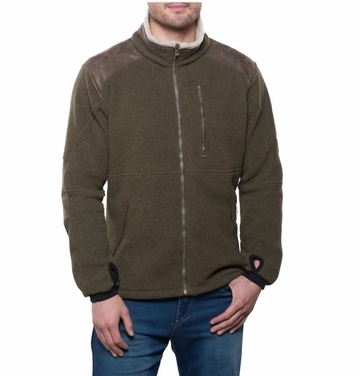 Suede micro fleece on the shoulders and elbows adds durability and creates a vintage look. Zippered hand pockets and a zippered chest pocket provide secure storage, while YKK Metalux zippers deliver reliable performance. Suede micro fleece on elbows"